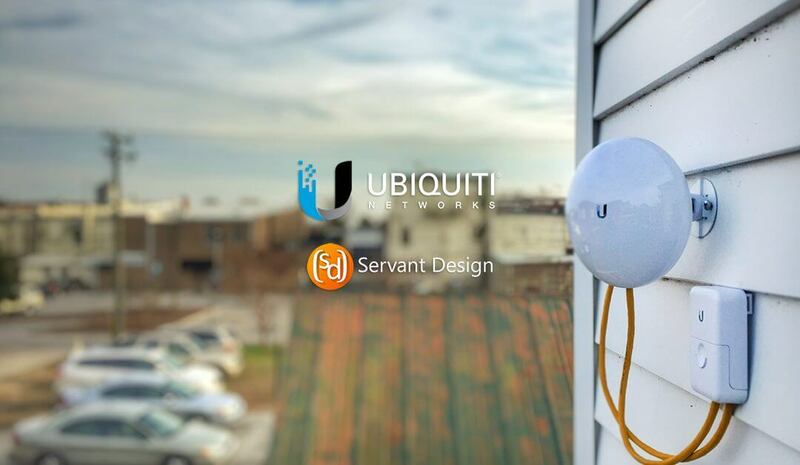 For the past three years, ServantDesign has been gradually expanding our investment in Ubiquiti’s products. When UBNT first came out with their UniFi line of products, people were a little skeptical at the idea of what we call Software Defined Networking, meaning all the network hardware is controlled by a software controller and not by any one configuration on one device. Since we’ve starting working with SDN we’ve found the UniFi product to be incredibly stable and the insight and control that the UniFi Controller gives to our clients to be a godsend. So what advantages can UniFi give your business where you thought things might be too expensive before? At nearly every site we service, we always install a UniFi Security Gateway. With this entry level firewall appliance/router in place, we can tie everything in the network to ServantDesign’s very own cloud UniFi Controller. Every client gets access to their site within the UniFi Controller and control over their own network. With UniFi’s products, your entire network becomes “managed”, what we would call Layer 3 switching and routing, meaning you can segment off certain sections of the network, assign different VLANs to specific ports, create guest networks that are unable to access the private network, etc. This is particularly helpful with offering guest wireless while keeping your private information secure. With UniFi, you can broadcast guest wireless from the same Wireless Access Points that you broadcast your private wireless, while keeping the guest wireless on an entirely separate network! Got multiple offices? Hate paying for a VPN or spending crazy amounts of money on high end Cisco equipment? With UniFi’s Security Gateway at each site connected to ServantDesign’s cloud controller, building VPN’s between offices is as easy as clicking your mouse. All UniFi hardware can be ordered by ServantDesign and preconfigured to your cloud site so that when it’s installed it’s up and running in no time. Have you got an outbuilding that’s just outside the range of wifi at your central office? Wireless point to point or point to multipoint is easier than ever with UniFi and Ubiquiti’s airMax antennas. Take the picture up above for instance. At Memorial Baptist Church in Williamston NC, we had a historic building located beside the main church building that needed network access for streaming media on Sunday mornings. The cost of running copper from the main office to an area where we could get out of the building, through the breezeway and up to the second floor of the historic building would have been more than they were willing to invest. We put together a set up of two Ubiquiti NanoBeam point to point antennas with inline surge suppression and a UniFi Switch 8 Port with a UniFi AP AC Lite on the receiving end and bridged the connection between the two buildings in just a few minutes. The NanoBeam’s support more throughput on 5ghz wireless than we’ll ever need from that building, so it was a low cost fix with rock solid stability. The best thing about these point to point solutions is that they all run on 24v or 48v power over ethernet. In areas where internet data is needed but power is a problem, the access points and antennas can very easily be run on small scale solar panels (with monitoring if you use Ubiquiti’s sunMax products!). UBNT’s point to point and multipoint wireless solutions are great, and even though the example above was only about a 100ft shot, we’ve installed smaller AC antennas at 700ft apart and the NanoBeams can work up to 5 miles in direct line of sight. On the high end of things are Ubiquiti’s airFiber, which can reach out and touch another antenna at 120 miles. Another point I’ll hit on today is one of the most common problems we run into dealing with mostly older buildings around these parts. Old construction, particularly plaster walls with wire mesh on the inside is like a sponge for wireless coverage. Another obstacle we’ve run into is construction with tin roofing, which seems to scatter directional antennas, particularly in the 2.4ghz spectrum. Mesh and High Density wireless is the solution for situations like that, and it all integrates with the UniFi Controller. One area where high density wireless would be great is a conference or fellowship hall, where HD access points could be ceiling mounted and handle up to 500 clients each. Areas with drop ceilings make a deployment like that super quick and easy. Places of worship, sanctuaries, funeral homes, etc where the construction is often older and the general ascetic doesn’t lend to having a Star Trek looking access point glowing from the ceiling are where mesh networking really shines indoors. One UniFi Mesh Pro AP can be wired to the network and hidden mostly out of site in an equipment room and up to 4 UniFi Meshpoints the size of a fountain pen can be placed anywhere within a 600ft radius with ac power and mesh themselves together with the main Pro AP. This keeps wires out of historic construction and preserves the look of the place of worship. We’ve been incredibly impressed by Ubiquiti’s equipment and amazing quality you get for 1/4 the price of other enterprise networking equipment. Contact ServantDesign to see how we can help network your business and provide better security and wireless coverage!